India: No Country For Old People? As India competes in the global economy, new challenges arise for its aging population, who once relied on their children to help them through old age. Morning Edition commentator Sandip Roy explains. 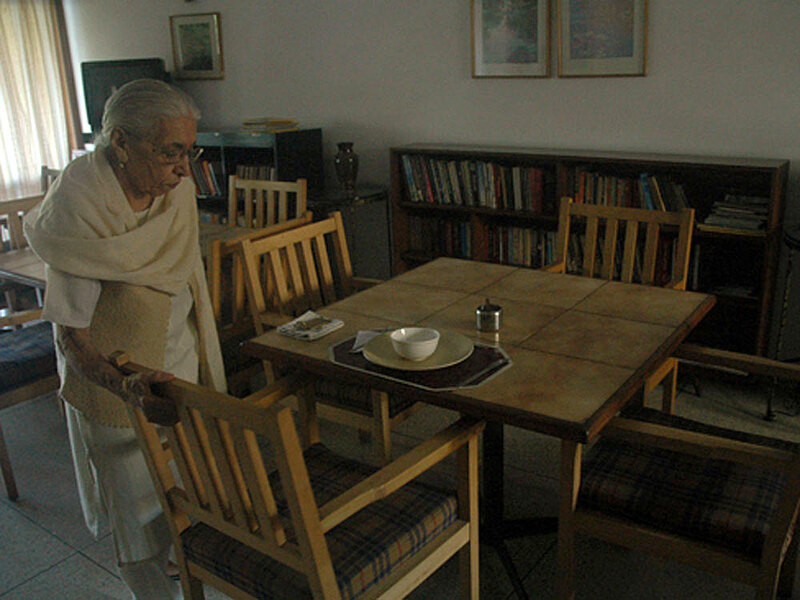 Bindu Ahlawadi gets used to meals for one at a pay-for-stay home in New Delhi. Her daughter lives in Pittsburgh. Stories about India these days tend to focus on the new India -- young, dynamic and with a rising GDP. But like many other parts of the world, India is graying rapidly. By 2050, a quarter of the population will be over 60. Once, India was known for its large extended families. But now, thanks to immigration and globalization, it's also full of empty-nesters. And there is not enough of an infrastructure yet to support the increasing services needed for these seniors. While a majority of Indians still live in multigenerational families, there is a growing anxiety about aging in India these days. Madan Engineer and his friends spend every day playing carom at Mumbai's Harmony Senior Center. The game is a sort of cross between billiards and shuffleboard. While other centers are open for just a few hours a day, this one allows seniors a place to come from 10:00 a.m. to 7:00 p.m.
"There is no club like this in Mumbai," Engineer says. My grandparents and great-grandparents didn't seem to need clubs. They all lived in our house. Growing up in India in the 1970s and '80s, I remember my great-grandmother making her own pickles, teaching me about gods and goddesses, playing endless games of solitaire in the sun. Manga Advani is the father of a friend of mine in California. Advani lives in New Delhi, while his son has made a new home in the U.S. Advani admits times have changed. "The generation now -- most of them just fly away out of the country. They don't have much time for their parents," Advani says. It is ridiculous for us to support a home for the aged. A child abroad was once a badge of pride for Indian parents. Money sent home gave them a boost up the economic ladder. But it's hard to be a dutiful child from across oceans. When my father died, I wasn't even able to get home before he was cremated. Irudaya Rajan, a demographer, says this is a common problem. "Anybody dies today, the body will be kept in the mortuary for two to three days with all the ice, because someone has got to come from Canada, someone from London," Rajan says. The problem isn't just that the children are off chasing the American dream; 81 million Indians are over age 60. But in the new India, old age isn't what it used to be. Once, someone told me, the grandfather always got the prized fish head at dinner. Now, that goes to the grandson. The government recently had to pass a law requiring children to take care of their parents. There were too many cases of seniors abandoned on the streets, according to Matthew Cherian, who runs the advocacy group Help Age India. "Very often, the children leave the parents in different parts. We put them in old-age homes meant for the poor and destitute. This person is middle class, but there is no other option but the destitute home," Cherian says. When I was growing up, the only homes for the aged were for poor Indians who had no family. They were run by people like Mother Teresa. We took donations of old clothes and cans of evaporated milk. Today, there's still not much help for seniors beyond their families. There is no social security, and few Indians have pensions. Aloka Mitra set up a home for older women in Calcutta in the 1970s. A government minister tried to talk her out of it. "He said, 'You ladies have nothing better to do, and so you are thinking up all these problems which don't exist. In our society, the aging are well looked after. It is ridiculous for us to support a home for the aged," Mitra says. The home she started, Naba Nir, is still going strong. Mitra, at 69, is now older than some of the residents. She worries about what she will do when the time comes to retire. "My son and daughter are both in London," she says, "In 10 years' time, we might need a home for the aging ourselves." And they might choose a new, more popular option --- a pay-for-stay home or a retirement community with uniformed maids and bonsai classes. Betty Kamath moved back to Bangalore to live in one after more than a decade in California with her children. She has three great-grandsons and loves to show the family photograph with four generations of Kamaths. But the youngest one looks out of place -- and he is. He's been pasted into the picture, because Betty has never seen him in person. Kamath was happy in California until her rheumatoid arthritis got worse. She was ready for a nursing home, but not one in America after she saw the way the attendants treated the older people. "They are quite rude," Kamath says. "They grumble if you call too much. You won't find that in India." Kamath can afford a 24-7 personal attendant in India. But an old-age home still carries a tinge of stigma here. Before she moved back, she wrote a letter to all her relatives explaining this was her decision, not her children's. "You know how people talk," Kamath says. "They would have said, 'Oh, they sent their mother back,' " she says. In California, Kamath's daughter, Cynthia D'souza, remembers when her mother told her about the decision. "I said, 'Are you sure, Mom?' She was so definite. She said, 'Can you help me in this transition?' The tears just flowed," D'souza remembers. Helping her mother move back to India has made D'souza think about her own retirement. For now, she plans to stay in the United States because that's where her children are. "I feel it would be a disservice for them to feel obligated to come see us and to make that journey," D'souza says. "So I think we will make ourselves happy here. We owe it to our kids," she says. D'souza and her siblings stay in touch with their mother through annual visits and weekly calls, just like I do. The last time I visited my mother in India, she told me to buy a CD with her new favorite song. It's about a couple who move to a retirement home because they have no place in their children's busy lives. My mother loves it, even though she lives with my sister and the grandchildren. I think sometimes she, too, feels this new India is no country for old women. Sandip Roy, editor with New America Media and host of its radio show New America Now on KALW 91.7 FM in San Francisco, traveled to India on a fellowship from the South Asian Journalists Association.